WE ARE READY MADE : KALIFORNIA HERE WE COME ! Cali guys Humberto and Carol take Kenzo to their own roots this time, their good old land of plenty (if we can consider California being a country), perhaps the most personal collection since their arrival. 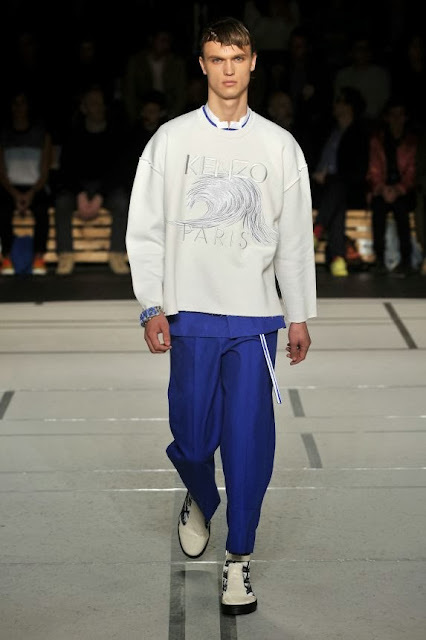 They have been succeeding in bringing Kenzo to another level, to the 21th century. 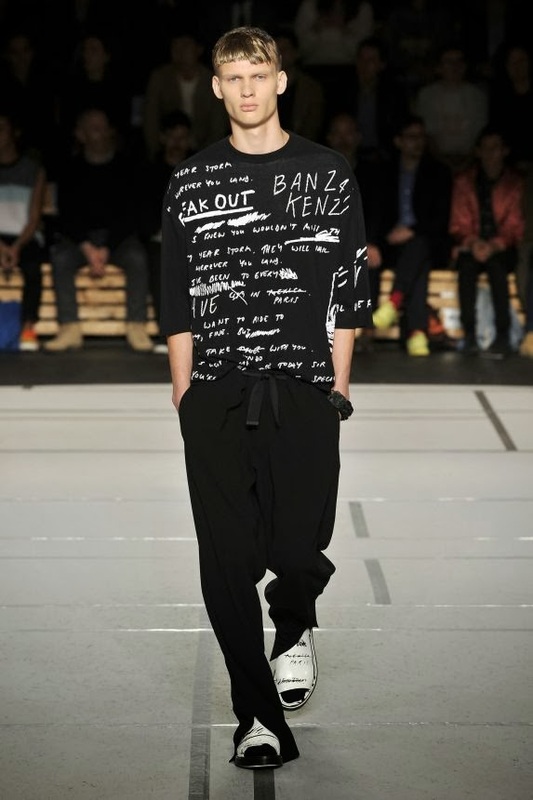 Considering the past collections, the tiger mania logo, now there is a Kenzo tribe, very recognizable in the streets (which is the best way to measure if you are the talk of the town, the brand on everyone's lips). In other words, if you made it to the streets, if you mean something to people. 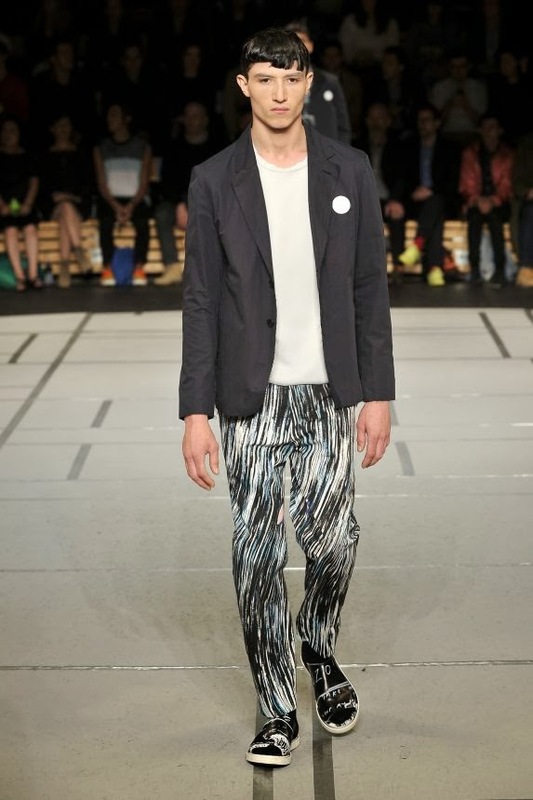 The emblematic eye-catching tiger is the best ambassador of the brand, part of the Kenzo's etho and a pattern that is going to be updated in several basics (hoodies, tees, sweaters, jumpers, bags and other accessories) season after season, as for the SS14, embracing the shades of blue. We like the idea of fusing classic tailoring with beach living. Jackets featuring large open backed vents to allow for a beach breeze, printed or reversible sequins, embroidered cropped tops resembling the crests of waves and K-biker jackets are the key pieces of the collection." It is Humberto and Carol own's Kalifornia which is the encounter of California and their concept for SS14, obviously a new direction really different from Jungle of the Sky, Eye, Icon and Flying Tiger of AW 14. As usual we were really impressed by how they managed to change the house dynamic, jumping to Kalifornia (which is also the name of a new bag). It's all about geometrical prints and hand writtren/drawn aqua motif, emphasizing the relationship between people and the sea: beach subculture. The two cotton molleton printed sweatshirts, one with a vintage logo with the hand drawn wave (for boys) and the one with blue no fish (for girls) are the new eye catching must-haves that everybody will rush to buy. It is highly Humberto and Carol era now, but we cannot ignore the tribute to the past, in the reference to the sea, reminding us of the Great Wave (by Hokuzai) being a pattern of the house like the roaring tiger. 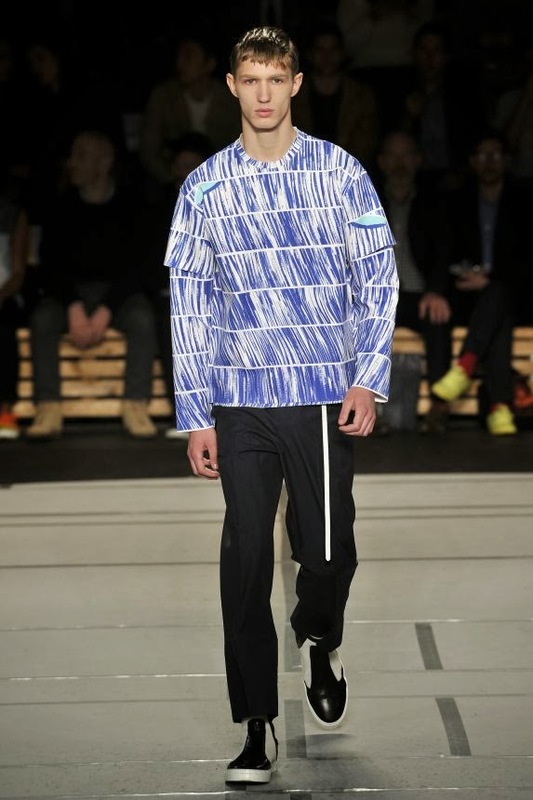 Not surprising the two designers know how to play with Kenzo's archives without being overwhelmed. It is also like the idea of reinterpreting neoprene, staying away for the diving cliché, sophisticating it, playing with the shape and the cut, especially all the cropped and the short sleeved tops which are another obsession for us, as well as all the hand drawn tailored daring pieces. 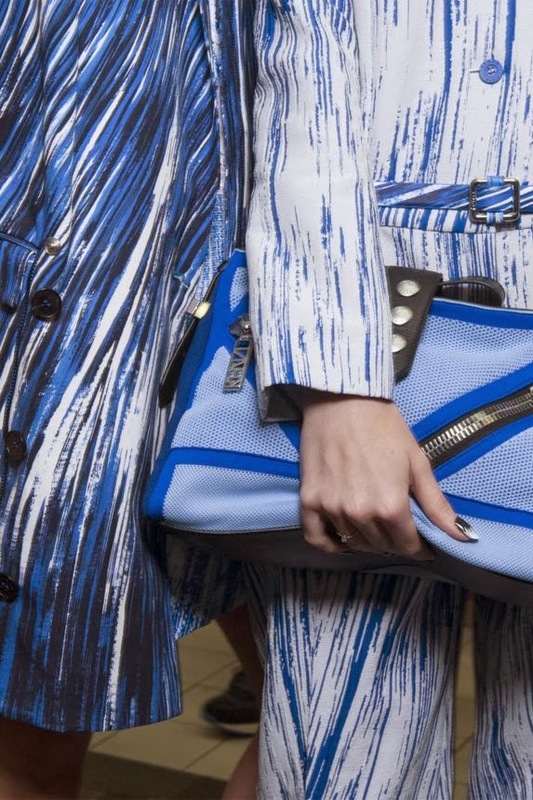 Blue klein (or Jil Sander blue) and Black (refering to L.A undergroung scene) are our favourite mix of colour. This collection is really made for us and it will be very very difficult not to surrender. 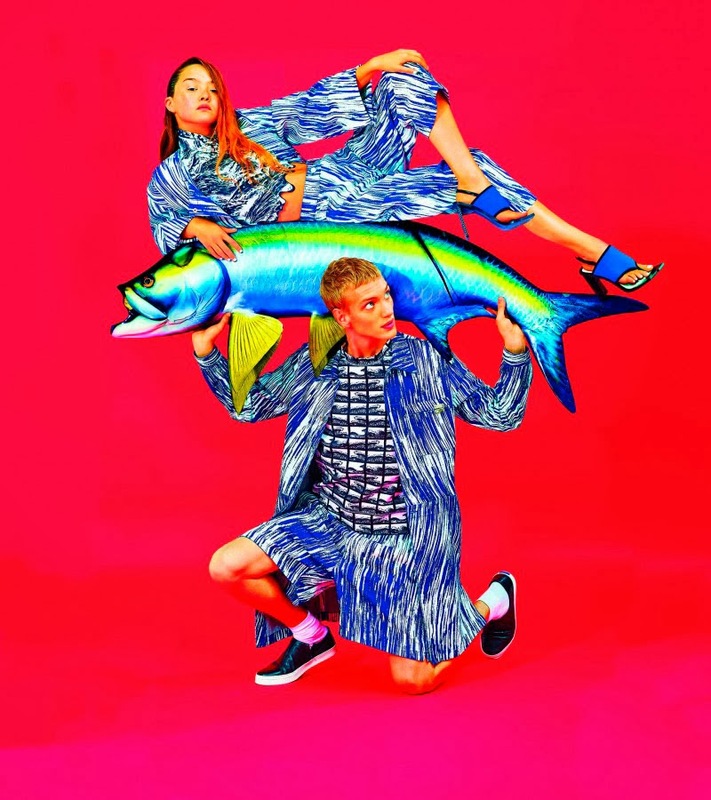 The No Fish No Nothing has already landed on Kenzo online and flagship store and we cannot wait to go on the trip to Kalifornia!